3890. John ROWE [scrapbook] 1 (Millicent C BUCK , Lovina WILLIAMS , Tamsa BITLER , John Wolf , John , Johannes ) was born on 28 Mar 1909 in Mount Carmel, Northumberland Co, PA. He died on 19 Jan 1969 in Sacred Heart Hospital, Chester, Delaware Co, PA. He was buried on 22 Jan 1969 in Lawn Croft Cemetery, Linwood, Delaware Co, PA.
John resided in 1910 in 234 E 2nd St, Mount Carmel, Norhumberland Co, PA. He resided in 1920 in 45 Walnut St, Mount Carmel, Northumberland Co, PA. He resided in 1920 in Marcus Hook, Delaware Co, PA. He resided in 1930 in 15 Maple St, Marcus Hook, Delaware Co, PA. He worked as roofer's helper - silk mill house in 1930. He was a member in 1940 in 15 Maple St, Marcus Hook, Delaware Co, PA. He worked as tin smith - silk mill in 1940. He worked as sheetmetal mechanic (40 yrs) with Viscose Division of FMC in Marcus Hook, PA. 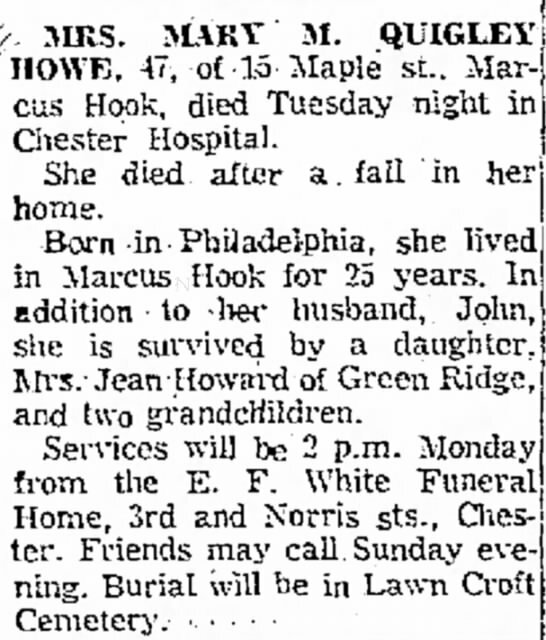 He resided in 1969 in 15 Maple St, Marcus Hook, Delaware Co, PA.
John married Mary B QUIGLEY [scrapbook] 1, 2 in 1932 in Mount Carmel, Northumberland Co, PA. Mary was born about 1911 in Philadelphia, Philadelphia Co, PA. She died on 25 Feb 1958 in Chester Hospital, Chester, Delaware Co, PA. She was buried on 3 Mar 1958 in Lawn Croft Cemetery, Linwood, Delaware Co, PA.
Mary resided in 1940 in 15 Maple St, Marcus Hook, Delaware Co, PA. She worked as waitress - restaurant in 1940. + 8152 F i Jean ROWE was born on 29 Jun 1933. She died on 17 Jun 1960. 3891. Paul ROWE 1 (Millicent C BUCK , Lovina WILLIAMS , Tamsa BITLER , John Wolf , John , Johannes ) was born on 4 Oct 1910 in PA. He died in 1978 in Ocala, Marion Co, FL. He was buried in Fero Memorial Gardens Cemetery, Beverly Hills, Citrus Co, FL. Paul resided in 1920 in 45 Walnut St, Mount Carmel, Northumberland Co, PA. He resided in 1930 in 15 Maple St, Marcus Hook, Delaware Co, PA. He worked as piper fitter's helper - ship yard in 1930. He resided in 1940 in 11 Spruce St, Marcus Hook, Delaware Co, PA. He worked as electrical engineer in 1940. 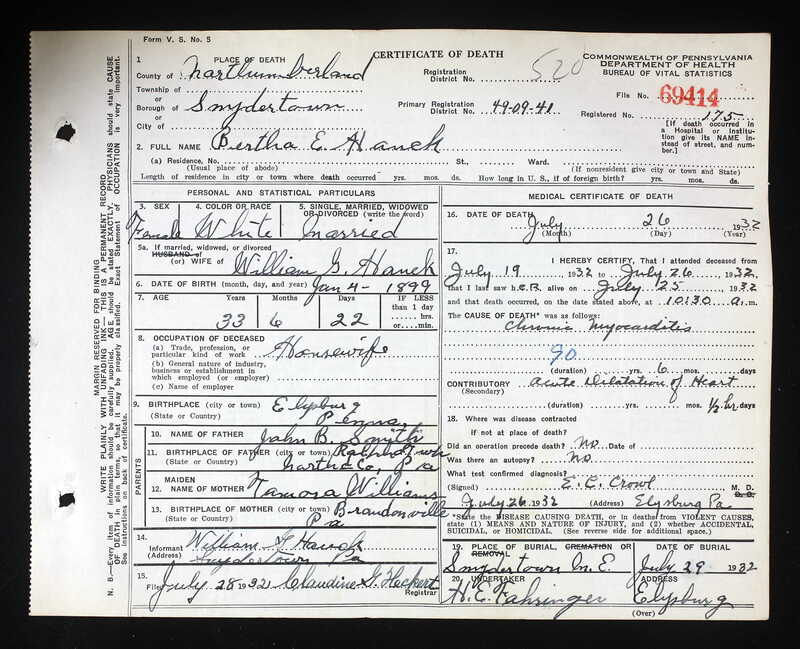 He resided in 1969 in Marcus Hook, Delaware Co, PA.
Paul married Dorothy M LEWIS 1, daughter of Ellis LEWIS and Esther M BOUCHET, on 30 Sep 1933 in Delaware Co, PA. Dorothy was born on 19 Nov 1914 in PA. She died on 7 Mar 1986 in Marion Co, FL. She was buried in Fero Memorial Gardens Cemetery, Beverly Hills, Citrus Co, FL. Dorothy resided in 1940 in 11 Spruce St, Marcus Hook, Delaware Co, PA.
+ 8153 M i Thomas Ellis ROWE Sr was born on 26 Jun 1934. He died on 4 Jan 2003. 8154 F ii Betty ROWE. 3892. Mildred Eva BUCK [scrapbook] 1 (Odillian BUCK , Lovina WILLIAMS , Tamsa BITLER , John Wolf , John , Johannes ) was born on 7 Nov 1905 in PA. She died on 30 Oct 1986 in PA. She was buried in Mount Carmel Cemetery, Mount Carmel, Northumberland Co, PA.
Mildred resided in 1910 in 12 Walnut St, Mount Carmel, Northumberland Co, PA. She resided in 1920 in Mount Carmel Twp, Northumberland Co, PA. She worked as factory - stocking mill in 1920. 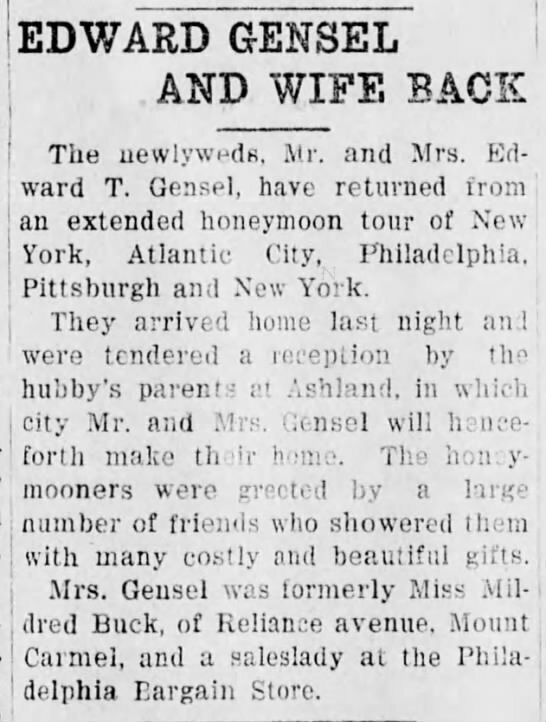 She resided in 1930 in Mount Carmel Twp, Northumberland Co, PA. She resided in 1930 in Company Rd, Locustdale, Columbia Co, PA. She resided in 1940 in 117 Walnut St, Ashland, Schuylkill Co, PA.
Mildred married Edward Franklin GENSEL [scrapbook] 1, son of Harry GENSEL and Ida E HADESTY, on 10 Nov 1925 in Odell Buck Home, Mount Carmel, Northumberland Co, PA. Edward was born on 11 Aug 1904 in PA. He died in Jul 1978 in Ashland, Schuylkill Co, PA. He was buried in Mount Carmel Cemetery, Mount Carmel, Northumberland Co, PA.
Edward resided in 1930 in Company Rd, Locustdale, Columbia Co, PA. He worked as loader - colliery in 1930. He resided in 1940 in 117 Walnut St, Ashland, Schuylkill Co, PA. He worked as car loader - coal mining in 1940. + 8155 F i Jean E GENSEL. Doris Inez GENSEL 1 was born on 11 Nov 1933 in Ashland, Schuylkill Co, PA. She died on 5 Aug 2008 in St. Catherine's Medical Center, Fountain Springs, Schuylkill Co, PA. She was buried in Brock Cemetery, Ashland, Schuylkill Co, PA.
Doris resided in 1940 in 117 Walnut St, Ashland, Schuylkill Co, PA. She graduated from Ashland High School in 1952. + 8157 M iii Donald GENSEL. 3894. Mary L BUCK 1 (Odillian BUCK , Lovina WILLIAMS , Tamsa BITLER , John Wolf , John , Johannes ) was born on 13 May 1910 in Mt Carmel, Schuylkill Co, PA. She died on 16 Jun 1973 in Danville, Montour Co, PA. She was buried in Mount Carmel Cemetery, Mount Carmel, Northumberland Co, PA.
Mary resided in 1920 in Mount Carmel Twp, Northumberland Co, PA. She resided in 1930 in Mount Carmel Twp, Northumberland Co, PA.
Mary married Allen L HORNBERGER 1. Allen was born in 1911. He died in 1973. He was buried in Mount Carmel Cemetery, Mount Carmel, Northumberland Co, PA.
8158 M i Raymond A HORNBERGER. Nancy E HORNBERGER [scrapbook] 1, 2 was born on 4 Jun 1937 in Mowry, Schuylkill Co, PA. She died on 5 Apr 2015 in Hickory House Nursing Home, Honey Brook, Chester CO, PA. She was buried on 11 Apr 2015 in Hephzibah Baptist Cemetery, East Fallowfield, Chester Co, PA.
Nancy resided in Coatesville, Chester Co, PA. She worked as Registered Nurse with Brandywine Hospital - Coronary Care Unit. She worked as Registered Nurse with Coatesville V.A. Medical Center. She worked as Registered Nurse with Coatesville Visiting Nurse Association. She was a member of Warwick Bible Church. Nancy married Harold D NUNEMAKER "Mac" 1, 2, son of Samuel J NUNEMAKER and Anna SWISHER, about 1971. Mac was born on 18 Sep 1925 in Coatesville, Chester Co, PA. He died on 25 Aug 2008 in Tel Hai Retirement Community, Honey Brook, Chester CO, PA. He was buried in Hephzibah Baptist Cemetery, East Fallowfield, Chester Co, PA.
Mac resided in 2008 in Coatesville, Chester Co, PA. He worked as flanger with Luken's Steel Co.. He worked as mainenance man with Coatesville Area School District. He was a member of Warwick Bible Church. He was a member of West End Fire Co. He was a member of Coatesville Lodge #564 F. & A.M. (past master). He was a member of Commandry #55. He was a member of Tall Cedars of Lebanon. 8160 F iii R. Carole HORNBERGER. R. Carole HORNBERGER married [Male] ANGELI. 3896. Carl W BUCK [scrapbook] 1 (Odillian BUCK , Lovina WILLIAMS , Tamsa BITLER , John Wolf , John , Johannes ) was born on 5 Mar 1915 in PA. He died on 24 May 2004 in Mount Carmel, Northumberland Co, PA. He was buried in Mount Carmel Cemetery, Mount Carmel, Northumberland Co, PA.
Carl resided in 1920 in Mount Carmel Twp, Northumberland Co, PA. He resided in 1930 in Mount Carmel Twp, Northumberland Co, PA. He resided in 1940 in Mount Carmel Twp, Northumberland Co, PA.
Carl married Ethel Mae MALICK [scrapbook] 1, daughter of Harry MALICK and Amanda SNYDER. Ethel was born on 20 Jul 1917 in Tamaqua, Schuylkill Co, PA. She died on 16 Jan 2014 in Mount Carmel, Northumberland Co, PA. She was buried in Mount Carmel Cemetery, Mount Carmel, Northumberland Co, PA.
Ethel was a member of First Congregational United Church of Christ in Mount Carmel, PA. She was a member of Grace United Church of Christ in Mount Carmel, PA. She worked as garment worker. She resided in Jan 2014 in Maple St, Mount Carmel, Northumberland Co, PA.
Judy BUCK 1 died in 2002. 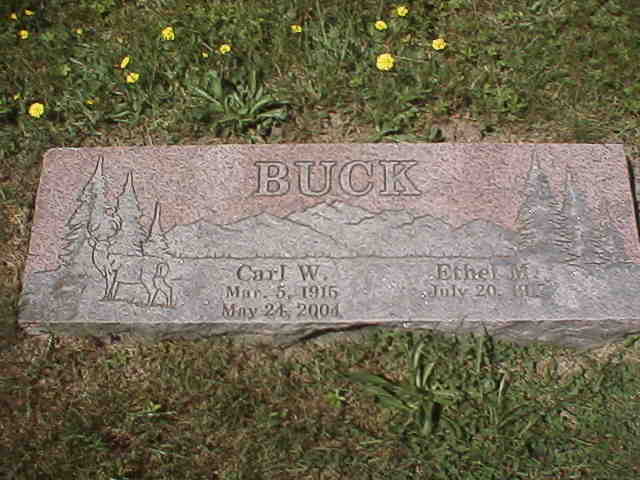 8162 M ii Carl W BUCK. 3898. Mary Esther BUCK [scrapbook] 1 (Benjamin A BUCK , Lovina WILLIAMS , Tamsa BITLER , John Wolf , John , Johannes ) was born on 30 Jun 1901 in Mount Carmel, Northumberland Co, PA. She died on 29 Jan 1949 in Shamokin State Hospital, Mount Carmel, Northumberland Co, PA. She was buried on 1 Feb 1949 in Mount Carmel Cemetery, Mount Carmel, Northumberland Co, PA.
Mary resided in 1910 in 1524 ? St, Ashland, Schuylkill Co, PA. She resided in 1918 in Doutyville, Northumberland Co, PA. She resided in 1920 in East Cameron Twp, Northumberland Co, PA. She worked as housekeeper - private family in 1920. She resided in 1930 in East Cameron Twp, Northumberland Co, PA. She resided in 1940 in East Cameron Twp, Northumberland Co, PA. She resided in 1943 in Mount Carmel, Northumberland Co, PA. She was a member of St. Paul's Evangelican United Brethren Church. 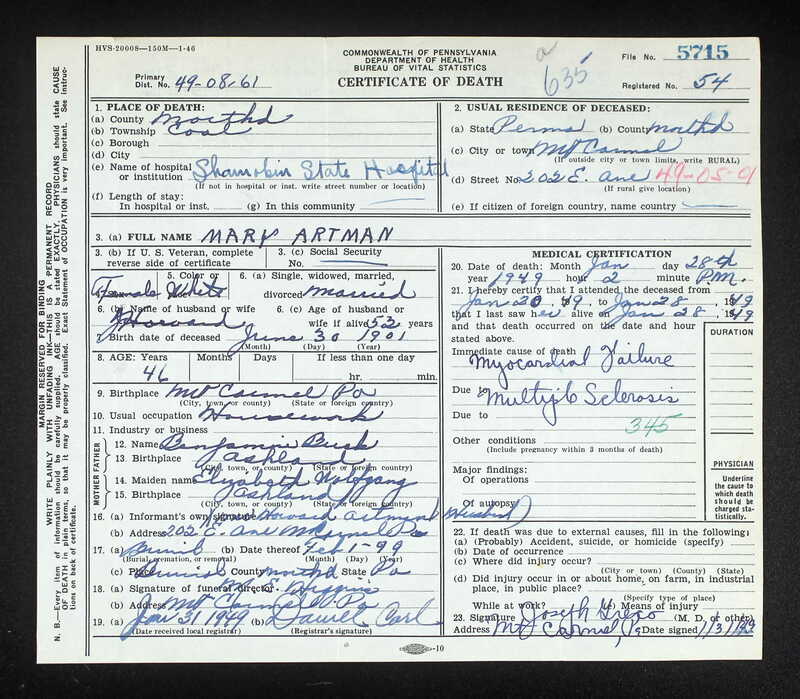 Mary married Howard Hardy ARTMAN "Tony" 1, son of Edward ARTMAN and Polly S. Tony was born in 1896 in PA. He died in May 1979 in Bensalem, Bucks Co, PA. He was buried in Mount Carmel Cemetery, Mount Carmel, Northumberland Co, PA.
Tony resided in 1910 in East Cameron Twp, Northumberland Co, PA. He resided in 1920 in East Cameron Twp, Northumberland Co, PA. He worked as laborer - coal mine in 1920. He resided in 1930 in East Cameron Twp, Northumberland Co, PA. He worked as miner - coal mine in 1930. He resided in 1940 in East Cameron Twp, Northumberland Co, PA. He worked as laborer - coal mines in 1940. + 8163 F i Carroll V "Jean" ARTMAN was born on 16 Oct 1918. She died on 6 Jul 1999. + 8164 M ii Marlin E "Comanche" ARTMAN was born on 29 Jan 1920. He died on 9 Sep 2004. + 8165 M iii Clifford B "Cliff" ARTMAN was born on 28 Oct 1922. He died on 9 Jul 2003. + 8166 M iv Rolland Hardy ARTMAN was born on 31 Mar 1924. He died on 12 Sep 1994. + 8167 F v Doris Suzanne ARTMAN was born on 19 Jan 1926. She died on 4 Jul 1998. + 8168 M vi Burr Franklin "Buzz" ARTMAN was born on 16 Oct 1927. He died on 17 Dec 1994. + 8169 M vii Vaughn D "Juzzer" ARTMAN was born on 17 Apr 1931. He died on 27 Aug 1991. Donald W ARTMAN [scrapbook] was born on 17 Apr 1931 in East Cameron Twp, Northumberland Co, PA. He died on 6 May 1932 in East Cameron Twp, Northumberland Co, PA. He was buried on 9 May 1932 in St Paul's Reformed Church Cemetery, Gowen City, Northumberland Co, PA.
Alice Renee ARTMAN 1 was born in 1932. She died in 1993. Alice resided in 1940 in East Cameron Twp, Northumberland Co, PA.
3904. Florence E SHIPE 1 (Ida M WILLIAMS , John Q WILLIAMS , Tamsa BITLER , John Wolf , John , Johannes ) was born about 1909 in PA. She died on 3 Dec 2001 in At Home, Mechanichsburg, Cumberland Co, PA. She was buried in Dec 2001 in Montoursville Cemetery, Montoursville, Lycoming Co, PA.
Florence resided in 1910 in 56 Seventh St, Sunbury, Northumberland Co, PA. She resided in 1920 in 1022 Chestnut St, Sunbury, Northumberland Co, PA. She resided in 1930 in 138 5th St, Sunbury, Northumberland Co, PA. She worked as Line Keeper - Shirt Co in 1930. She was a member of Wesley United Methodist Church. She was issued a social security number before 1951 in PA.
Florence married William Grant ROMIG 1, son of William H ROMIG and Anna HUBER. William was born about 1903 in PA.
+ 8172 F i Shirley R ROMIG. 3905. Ruth Lorraine SHIPE 1, 2 (Ida M WILLIAMS , John Q WILLIAMS , Tamsa BITLER , John Wolf , John , Johannes ) was born on 4 Jan 1912 in Sunbury, Northumberland Co, PA. She died on 25 Dec 2008 in Centre Crest Nursing Home, Bellefonte, Centre Co, PA. She was buried in Pomfret Manor Cemetery, Sunbury, Northumberland Co, PA.
Ruth resided in 1920 in 1022 Chestnut St, Sunbury, Northumberland Co, PA. She resided in 1930 in 138 5th St, Sunbury, Northumberland Co, PA. She was a member of Methodist. She resided in 2001 in Lock Haven, Clinton Co, PA.
Ruth married Rev David W HOVIES 1, son of Charles F HOVIES and Jennie E. David was born on 20 Apr 1910. He died on 27 Jun 1973. 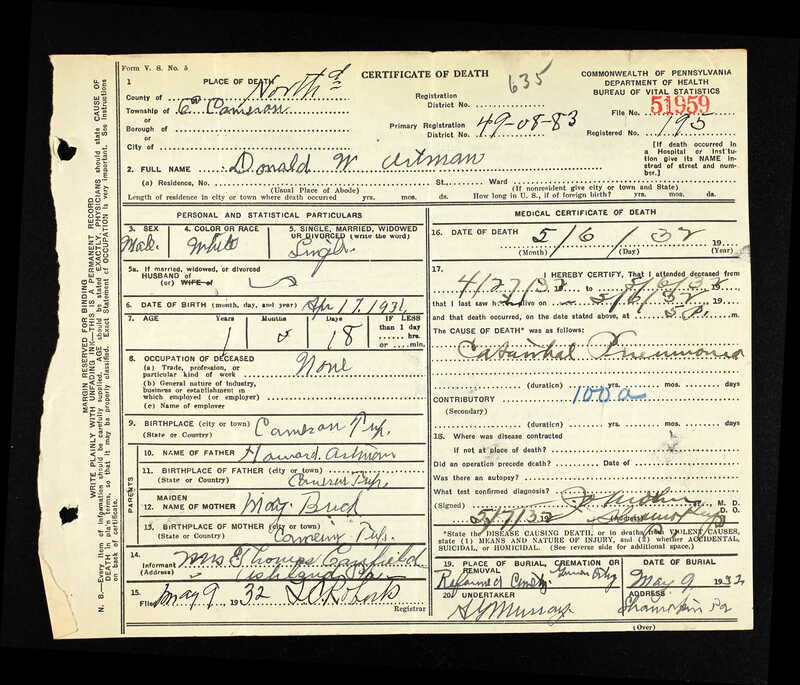 David resided in 1920 in Sunbury, Northumberland Co, PA. He resided in 1930 in Sunbury, Northumberland Co, PA. He was issued a social security number before 1951 in PA. He resided in Dec 2001 in Lock Haven, Clinton Co, PA. He worked as Methodist Minister. + 8173 M i David L HOVIES. 3907. Jacob LeRoy "Roy" SMITH [scrapbook] (Tamora Catherine WILLIAMS , Erastus F WILLIAMS , Tamsa BITLER , John Wolf , John , Johannes ) was born on 29 Apr 1895 in Elysburg, Ralpho Twp, Northumberland Co, PA. He died on 27 Dec 1971 in Shamokin, Northumberland Co, PA. He was buried in Shamokin Cemetery, Shamokin, Northumberland Co, PA.
Roy resided in 1900 in Ralpho Twp, Northumberland Co, PA. He resided in 1910 in Ralpho Twp, Northumberland Co, PA. He worked as Laborer - Odd Jobs in 1910. 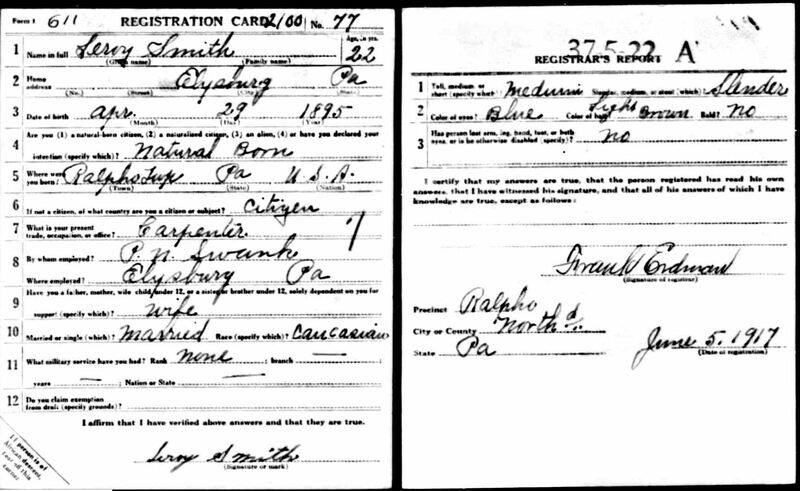 He resided in Jun 1917 in Elysburg, Northumberland Co, PA. He worked as Carpenter with P. N. Swank in Jun 1917 in Elysburg, PA. He served in the military 1 with U.S. Army - Private - Specialist Det. Rep. Trn. Center from 25 Aug 1918 to 14 Dec 1918 in WW I. He resided in 1920 in Ralpho Twp, Northumberland Co, PA. He worked as Carpenter - House Work in 1920. He resided in 1942 in 23 S. 8th St, Shamokin, Northumberland Co, PA. He worked with Nelson Pedly in 1942 in Chester, Delaware Co, PA. He resided in Dec 1971 in 23 S. 8th St, Shamokin, Northumberland Co, PA.
Roy married Mary Barbara MILLER before Jun 1917. Mary was born on 27 Oct 1895 in Shamokin, Northumberland Co, PA. She died on 30 Dec 1982 in Shamokin, Northumberland Co, PA.
Mary resided in Dec 1971 in 23 S. 8th St, Shamokin, Northumberland Co, PA.
8174 M i [Male] SMITH. + 8175 F ii Beverly J SMITH. 3908. Bertha Elizabeth SMITH [scrapbook] (Tamora Catherine WILLIAMS , Erastus F WILLIAMS , Tamsa BITLER , John Wolf , John , Johannes ) was born on 4 Jan 1899 in Elysburg, Northumberland Co, PA. She died on 26 Jul 1932 in Snydertown, Northumberland Co, PA. She was buried on 29 Jul 1932 in Snydertown United Methodist Cemetery, Snydertown, Northumberland Co, PA.
Bertha resided in 1900 in Ralpho Twp, Northumberland Co, PA. She resided in 1910 in Ralpho Twp, Northumberland Co, PA. She resided in 1920 in Ralpho Twp, Northumberland Co, PA. She worked as Housekeeper - Home Farm in 1920. 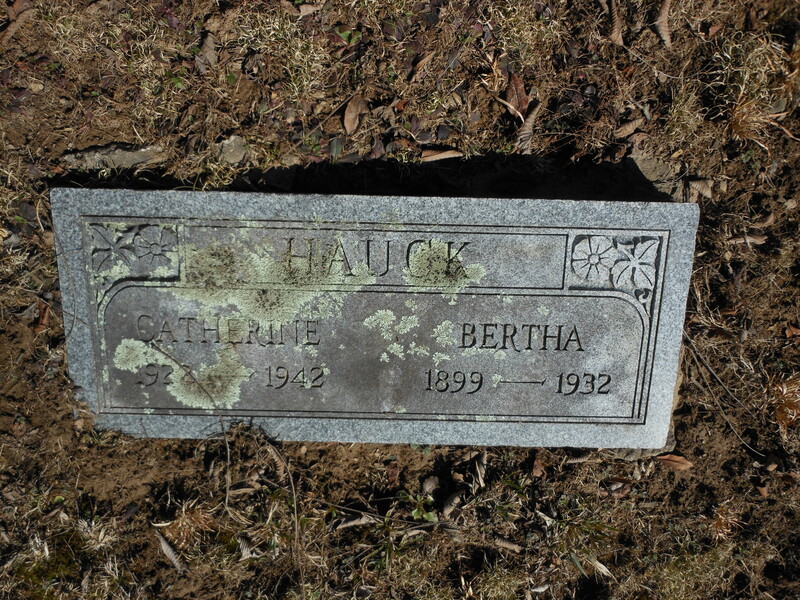 Bertha married William G HAUCK. William was born about 1898 in PA.
William resided in 1920 in Ralpho Twp, Northumberland Co, PA. He worked as Engineer - Coal Digger in 1920. Catherine HAUCK [scrapbook] was born in 1922. She died in 1942. She was buried in Snydertown United Methodist Cemetery, Snydertown, Northumberland Co, PA.
3911. Henry William SMITH 1 (Tamora Catherine WILLIAMS , Erastus F WILLIAMS , Tamsa BITLER , John Wolf , John , Johannes ) was born on 13 Aug 1911 in Elysburg, Northumberland Co, PA. He died on 5 Dec 1982 in Shamokin, Northumberland Co, PA.
Henry resided in 1920 in Ralpho Twp, Northumberland Co, PA.
8177 M i [Male] SMITH. 8178 F ii [Female] SMITH. 8179 M iii [Male] SMITH. 3916. Roger W GELNETT Sr [scrapbook] 1, 2 (Dora Lilly WILLIAMS , Erastus F WILLIAMS , Tamsa BITLER , John Wolf , John , Johannes ) was born on 10 Dec 1917 in PA. He died on 27 Apr 1995 in Lebanon Veterans Administration Medical Center, Lebanon, Lebanon Co, PA. 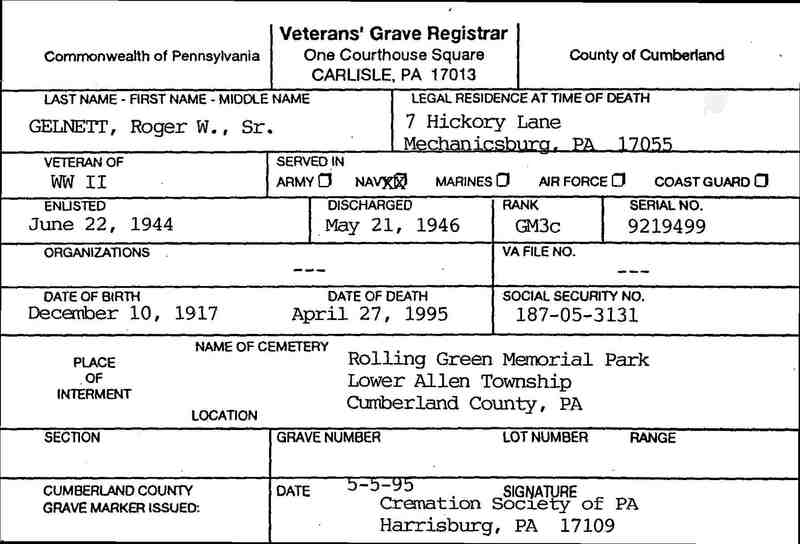 He was buried in Rolling Green Memorial Park, Lower Allen Twp, Cumberland Co, PA.
Roger resided in 1920 in Market St, Coal Twp, Nurthumberland Co, PA. He resided in 1930 in Market St, Coal Twp, Nurthumberland Co, PA. He was issued a social security number before 1951 in PA. He resided in 1995 in 7 Hickory Ln, Mechanichsburg, Cumberland Co, PA. He served in the military with U.S. Navy - GM 3c in WW II. He worked as Systems Analyst with Navy Ships Parts Control Center. He was a member of VFW Post 477 in Carlisle, PA. He was a member of Elks Lodge 578 in Carlisle, PA. He was a member of Moose Lodge 761 in Carlisle, PA.
Roger married Alice K KIM 1, 2, daughter of Pyung Lak KIM and Pyong Koo CHANG. Alice was born on 15 Mar 1923 in Kauai Co, HI. She died on 15 Oct 2007 in Harrisburg Hospital, Harrisburg, Dauphin Co, PA. She was buried in Rolling Green Memorial Park, Lower Allen Twp, Cumberland Co, PA.
Alice graduated from Kauai High School on 7 Dec 1941. She worked as Comunications Dept with Pearl Harbor. She worked as Planning Division Department with Pearl Harbor Ship Yard. She worked as Ordnance Supply Department in Mechanichsburg, Cumberland Co, PA. She resided in Carlisle, Cumberland Co, PA. She resided in Mechanichsburg, Cumberland Co, PA.
+ 8180 M i Roger W GELNETT Jr was born on 6 Dec 1950. He died on 10 Sep 2009. + 8181 F ii Carolynn P GELNETT.